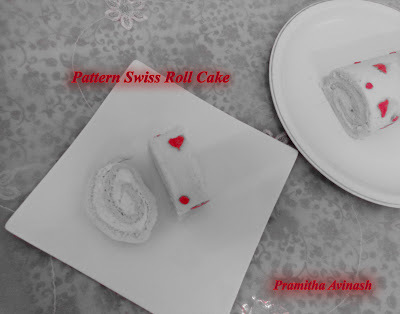 1.Before making the cake,make the filling ready.In a mixing bowl place the whipping cream, vanilla extract, and sugar and stir to combine. Cover and chill the bowl and whisk in the refrigerator for at least 30 minutes, then beat the mixture just until stiff peaks form.Then add the strawberry jam and beat for 2 mins.Keep it in the fridge. 2.First draw the pattern of your choice on a paper,then put your pattern on a baking tray and cover it with parchment paper or wax paper. 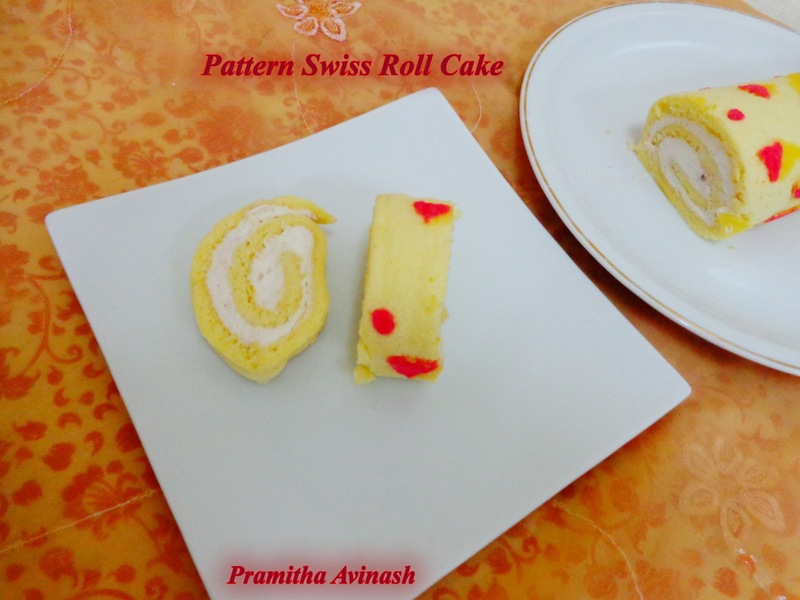 This make easier to pipe .You can either draw the pattern full on the paper or half portion of the paper like I did.If you are doing like me,then be carefull while rolling the cake.The pattern portion should come outside and plain portion should go inside. 3.In a small bowl add the egg whites,sugar and flour then stir well and add the room temperature butter and mix well.Add the food color of your choice,I used red color.You can even use different colors for the pattern.For example divide the batter into two bowls and add different colors of your choice. 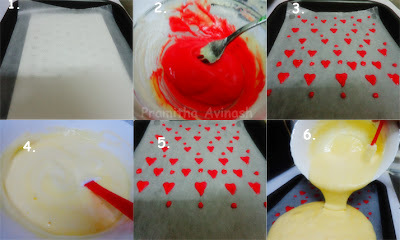 4.Take the piping bag and put the batter into it and start decortating the pattern.Then freeze it for 10 mins.If you are using double colors,then first complete the design with one color and freeze for 10 mins then use the other color and again freeze it. 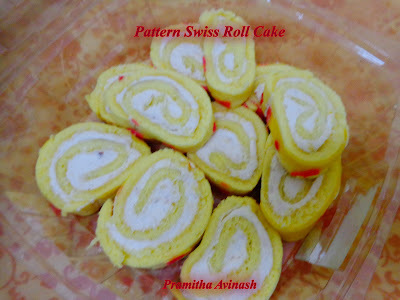 5.Meantime make the roll cake batter, In a bowl, sift both the flour and set aside. 6. In a large bowl, using a electric hand mixer, beat the 3egg yolks and 2 whole eggs along with half cup of sugar, until they become thick and fluffy.Then beat in vanilla extract. 7.In a separate clean bowl, add the egg whites and salt and beat until foamy. Gradually beat in 1tbs of sugar and continue to beat until the egg whites develop stiff peaks. 8.Add a little of the egg whites to the egg yolk mixture and fold in gently then add the rest of the egg whites and gently fold in. 9.Add half of the flour mixture and melted butter over the egg mixture and fold in gently with a wooden spoon or rubber spatula.Add the remaining flour and butter into batter and gentle mix everything together until the flour is incoperated.Do not over mix. 10.Now take out the tray from the freeze and pour the mixture over the pattern and evenly spread the batter.Bake the cake for 6-8 mins in a preheated oven at 230 degree C.
11. Don’t overbake because it will be hard to roll and it might crack. 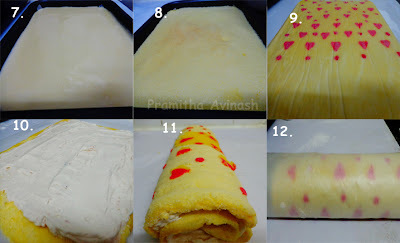 12.When the cake is ready, run a knife around the sides of the pan,then invert onto the the wax paper or parchment paper sprinkled with confectioners sugar and remove the wax paper very carefully.Then again invert the cake onto the parchment paper and spread the whipped cream filling with jam and roll the cake carefully.Make sure pattern portion should come outside. 13. Cover the roll cake with wax paper or parchment paper and place the cake in the fridge for a minimum of 2 hours to set. Woww..Lots of patience dear...Gud wrk..
thankz dear and i will let you know.. 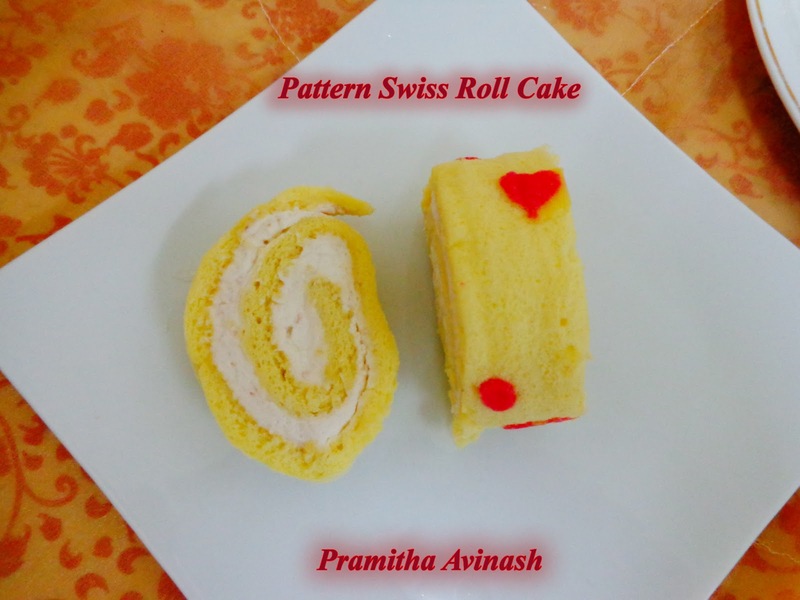 Stunning work ,those pattern swiss roll cake looks absolutely gorgeous. 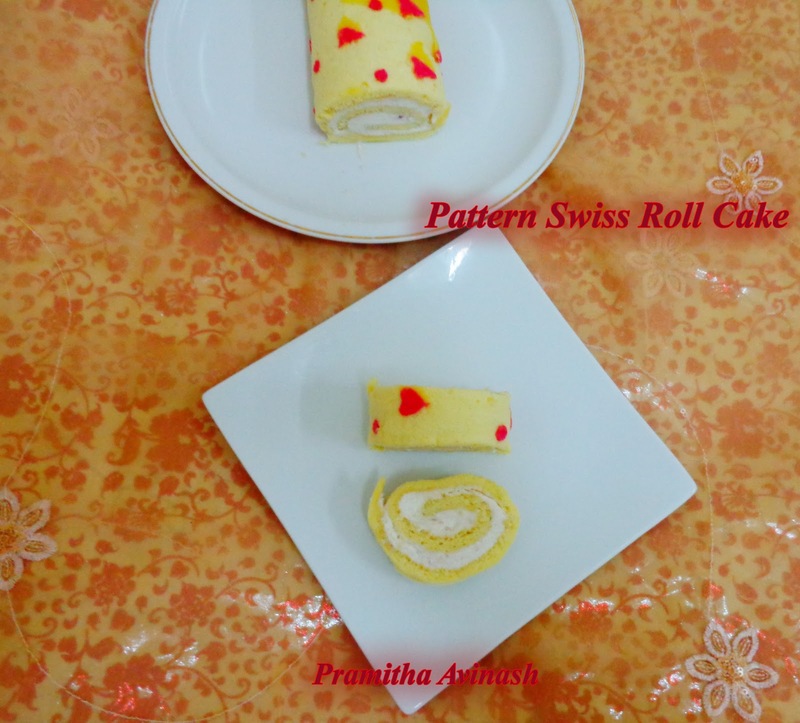 Swiss roll looks superb... love the pattern on the cake..
awww Mouthwatering i want to make and eat this now ! 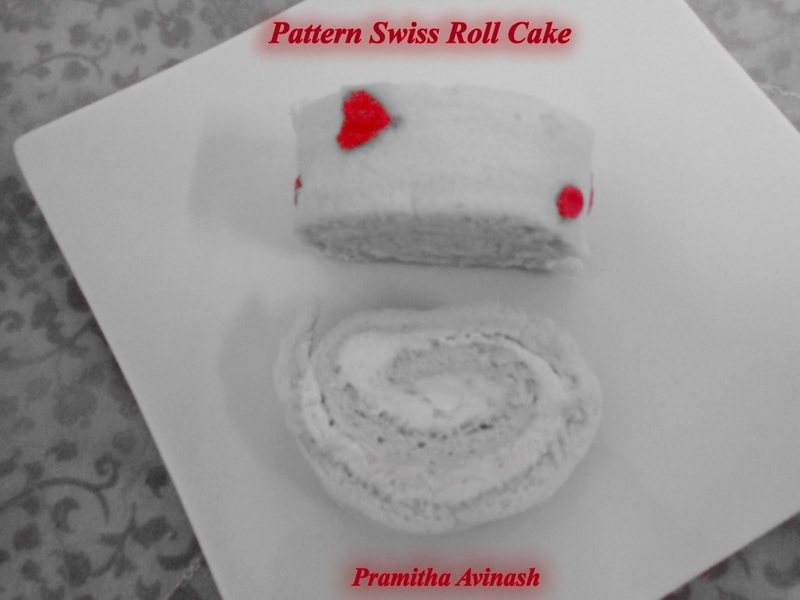 what a creative work...looks yummy and perfect..happy to follow you,would be happy if you too followed my blog..
gud1 ...Excellent "ll try this soon ! Wow so lovely. and so stunning.Loved the clicks. Thank you so much for your entry linked in my blog.